Donald Trump responds to Mitt Romney’s attacks. Donald Trump responds to Mitt Romney during a rally in Portland, Maine, on Thursday. Trump, of course, chose the latter—repeatedly. After 10 minutes or so of the usual small talk, the GOP front-runner finally turned his attention to the 2012 GOP nominee. “I’ll just address it quickly because it’s irrelevant,” Trump said, before going on to speak about Romney at length. “Look, Mitt is a failed candidate. He failed. He failed horribly.” The real estate tycoon then offered his version of how Romney lost a 2012 race that should have never been lost (“you’re running against a failed president!”) and how Jeb Bush convinced Romney not to run at this time last year (“now that he’s out, I’ll say Jeb’s a good salesman, right, he’s a high energy salesman!”). He also told a random story about holding a Romney fundraiser in 2012 at which his carpet was ruined by donors who tracked in water from the rainy streets. 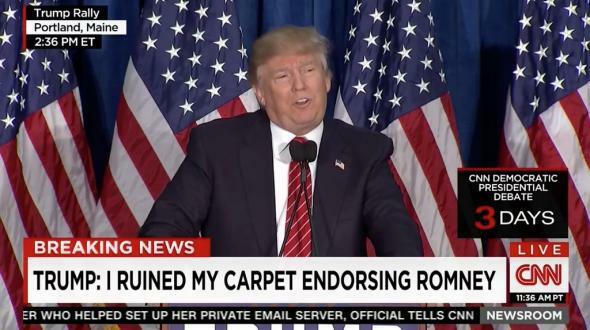 “Hey, maybe I can send Mitt a bill for carpet ruined,” Trump said. It was while Trump was reminding everyone that Romney went out of his way to ask for his endorsement four years ago that Trump did what Trump does best, delivering the type of line that’s tailor-made for Twitter and our outrage age. “I could have said, ‘Mitt drop to your knees,’ ” the former reality TV star said to cheers. Now, it’s impossible to say for certain that the Donald was making a crass blow-job joke—and that’s the point. Like his “wherever” comment about Megyn Kelly last August, or his “schlonged” remark about Hillary Clinton back in December, Trump’s “drop to your knees” wording lends itself easily to a salacious reading while still offering Trump the chance to deny it was his intent. All in all, though, Trump’s nearly hourlong speech wasn’t all that different from his usual rallies, where his remarks are rarely scripted but still relatively predictable. He was interrupted by protesters, several of which were escorted out by security, and he was interrupted with chants of support from the crowd, which he repeatedly acknowledged. In between responding to Romney, Trump found time to take a few shots at Marco Rubio, mention his lead in the polls, blame Mexico for New England’s heroin epidemic, and complain about the “dishonest” press. His overarching message: I’m a winner and can’t be stopped. In short, he acted the same as he has for the past nine months, so, you know, he’s right.